Just got her yesterday and had a quick 3 hrs play with the old strings and changed the strings and gave her a nice cleanup after dinner. The top is OMG beautiful. I don't think i have seen anything this rare and beautiful before. The pickups have been changed by the previous owner to Bare knuckle nail bombs ( i don't know why) sounds OK ( not full PAF, but still , i'll give it a try) Unplugged she is very loud and musical. Tuners have been changed to Grover ratio tuners, stays in tune thats what matters. Here are some shots from the shop i bought it from, here in Europe its winter now and the sun rarely comes out and hiding behind the clouds so no pics from me. I haven't used flckr for a long time but you might be able to right click with your mouse and choose Copy Image and then come here and Paste them into your reply box. Love that top. Great looking guitar . that top looks like a lava flow. amazing. 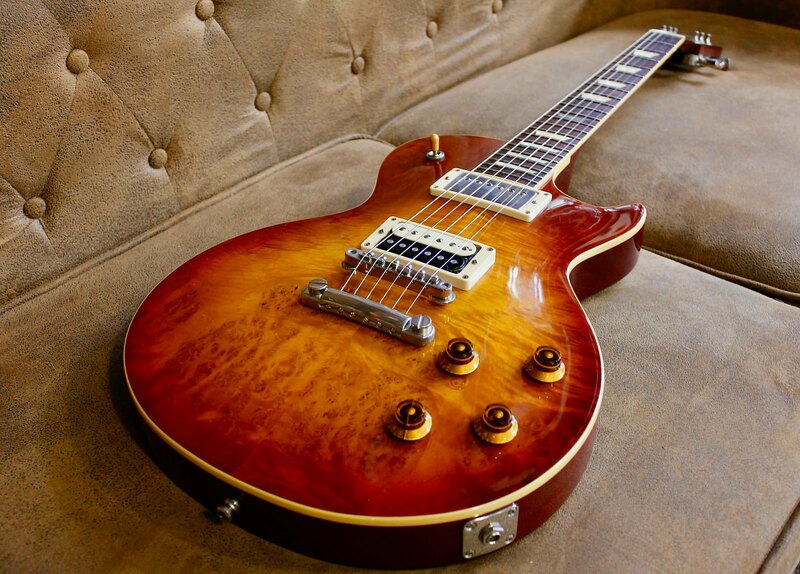 It's only an opinion, but a guitar as beautiful as that deserves a set of PAF clone pickups to get the best out of it. How do i post BIG pictures using flickr? While in Flickr click on the arrow pointing down in the bottom right corner and choose "view all sizes". Once the new page opens, select the size you want at the top then right click on the photo, copy image location, and paste it in here via the "image" button. That's a stunner. I'm seriously considering one of these myself. Re: the fingerboard, I've read that they use jacaranda - apologies if I spelt that wrong. I've also read that may be either an alternate name of BRW, or a 'cover' they use to get around CITES. I'm no expert, so I wouldn't know either way. I DO own a Tokai, though - a 36yo Strat-a-like - so whatever it actually is, you can rest assured it's top notch and not detrimental to it's tone. I agree with the guy about the pickups. I'd throw a set of Monty's PAFs on it. Pretty sure they did not use BRW on these but that top is incredible. One of the coolest I've seen and definitely the most unique. Very nice, what a unique looking top. I do miss my Tokai, I had a rare 1980 Reborn Old and I ended up needing to sell it in order to fund my Gibson LP. Was probably every bit as good TBH! I'm sure you're gonna enjoy it, I'm a little jealous haha. What happened to the pickup ring, was there ever one on it? You mean the ring or the cover? The Ring cracked because as you see from the picture they had mounted the pickup backwards and forced the ring screws in. As for the covers i have no idea but i like it as it is without the covers but turned over. I think i will get a similar looking PAF set ( Monty's may be ) when my bank balance stabilizes a little bit. I have a set of OX4 in my Tokai LS1 R9 and a Joe Bonamassa 1959 set in my Greco EG59 and they sound killer. With the Nail bombs there is that Spikey top when the tone is above 5 and still too much treble when tone is zero so no proper woman tone. What do you guys recon will a magnet swap help with things? May be Alnico II? I they they have Al5 in the neck and ceramic in the bridge. If you're in the UK, it may be worth ringing Tim Mills at Bare Knuckles and discussing it with him. He'll know better than anyone.... who knows, he may be able to rewind or mod those to suit for less than the cost of a new set. It costs nothing, other than a phone call for his advice. Well I put them up for sale on the inter webs if anyone wants it just write me, and i will put it up on reverb tonight. I wrote him yesterday, no reply.